EU Law Analysis: Referendum Briefing 3: Does the EU have a ‘democratic deficit’? Referendum Briefing 3: Does the EU have a ‘democratic deficit’? The EU is regularly accused from suffering a ‘democratic deficit’. In particular, it is often asserted that all EU decisions are made by the EU Commission – who are ‘unelected bureaucrats’. As we demonstrate in this post, this criticism is clearly invalid. It fundamentally misunderstands (a) the powers that the Commission has – and more generally how decisions are made in the European Union; and (b) the way in which the European Commission gets into office. We will examine each of those issues in turn. Who does what? Does the Commission adopt all EU laws? The crucial thing about the EU system is that the Commission does not have anywhere near as much power as many people think it has. The standard EU’s decision-making process is: the Commission alone makes legislative proposals. Those proposals are then considered by the Council (the intergovernmental body representing elected national governments), jointly with the elected Members of the European Parliament (representing EU citizens), whose powers have been gradually and significantly increased over the last three decades. Some people say that the Council and European Parliament simply rubber-stamp Commission proposals, but that is not true: they sometimes reject them and almost always amend them. In addition, national parliaments have seen their involvement with the EU’s decision-making process formally recognised and all draft legislative acts, for instance, must be forwarded to them. If enough national parliaments object to an EU proposal, it must be reconsidered (a so-called ‘yellow card’). The UK’s renegotiation deal says that if enough national parliaments object to a proposed law, it will be rejected (so-called ‘red card’). Any major changes to the EU (new Member States, new Treaties) have to be approved by national parliaments. Overall guidance on what policies the EU should take comes not only from the Commission but also from the European Council – the EU body made up of Member States’ Prime Ministers and Presidents, such as Cameron, Hollande and Merkel. When they call for the proposal of an EU law on an issue the Commission usually reacts quickly. The Council and European Parliament can also ask the Commission to propose laws. Although a lot of EU decisions are made by a ‘qualified majority’ in the Council (meaning they need 55% of the Member States with 65% of the population to support them), there is a tradition of seeking wide consensus. 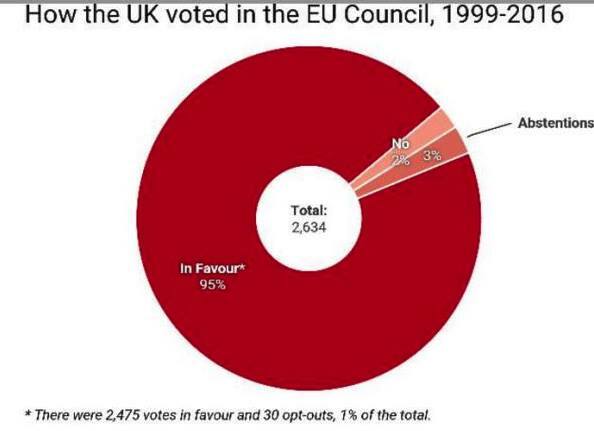 So – as the graph at the top of this blog post indicates – the UK has in recent years voted in favour of 95% of EU laws. Once an EU law is adopted the Treaties say that implementation powers are left in principle to Member States. So it’s up to national authorities to apply most laws which Member States have agreed in the EU. As an exception the Commission has powers in a few cases to adopt some detailed further rules to implement the technical details of an EU law which was already agreed, so that the EU law applies in the same way in all Member States. But the Commission’s use of such powers is controlled by Member States and the European Parliament, who can block such draft technical measures. This is similar to the process in most national systems – including the UK, where the government drafts ‘Statutory Instruments’ which the House of Commons or House of Lords can block. This system is a complex one because it has to reflect several and sometimes competing objectives such as the necessity to ensure the fair treatment of all Member States from the largest to the smallest. Member States insist on retaining their control over the EU’s decision-making process to democracy at the national level, and democratic legitimacy at EU level is reflected by the strengthening over time of the legislative, budgetary and supervisory roles of the European Parliament whose position as a ‘co-legislator’, jointly with the Council, is now firmly established. It is because the member states believe that their national interests were and continue to be better served by an independent Commission with atypical powers (e.g. the Commission’s monopoly on legislative initiative or its enforcement powers) that the Commission’s role, functions and powers have been left essentially unchanged since the Treaty establishing the European Economic Community of 1957. To argue that such the EU’s system of governance is not democratic illustrates a failure to grasp that, in fact, the EU’s institutional framework has been specifically designed not to function on the basis of a mere majority rule but on the contrary, as an highly consensual system where nothing of importance can be agreed without the joint consent of the Commission, Parliament and Member States’ governments in the Council. With respect to the Commission, critics quite often point out that it alone has the right of legislative initiative, meaning that legislative acts may be adopted solely on the basis of a Commission proposal. However, they usually fail to point out that, as noted above, EU leaders often ask for the Commission to propose a new EU law; both the Council and the Parliament have the formal power to ask the Commission for a proposal; and the Council and the Parliament must adopt proposals from the Commission for them to become law. In practice, the annual work programmes adopted by the Commission are in any event devised in the light of a process of intensive and continuous dialogue with the European Parliament and the Council. One may also note in passing that at the national level, bills tend to be written by civil servants working for ministerial departments. In the UK, in practice Private Members’ Bills cannot be adopted unless the government wants them to be. Finally, a word about EU judges. They are often described as ‘unelected’ – but of course judges in the UK and most other countries are unelected as well. In fact, the UK has a veto over the appointment of EU judges. So none of them can take up their jobs in the first place or keep their jobs (appointments are reviewed every six years) without the UK government’s approval. It’s simply inaccurate to describe the Commission as ‘unelected’. Rather, like many national legislative bodies, it is elected indirectly – meaning that it is appointed by people who are directly elected. A candidate for President of the Commission is selected by the national Heads of State and Government (each democratically accountable to their own Member State), taking into account the results of the elections to the European Parliament. In other words, the choice of the Commission President is based on which party got the most seats in the European Parliament elections – just as the choice of the UK Prime Minister is based on who gets the most seats in a UK general election. 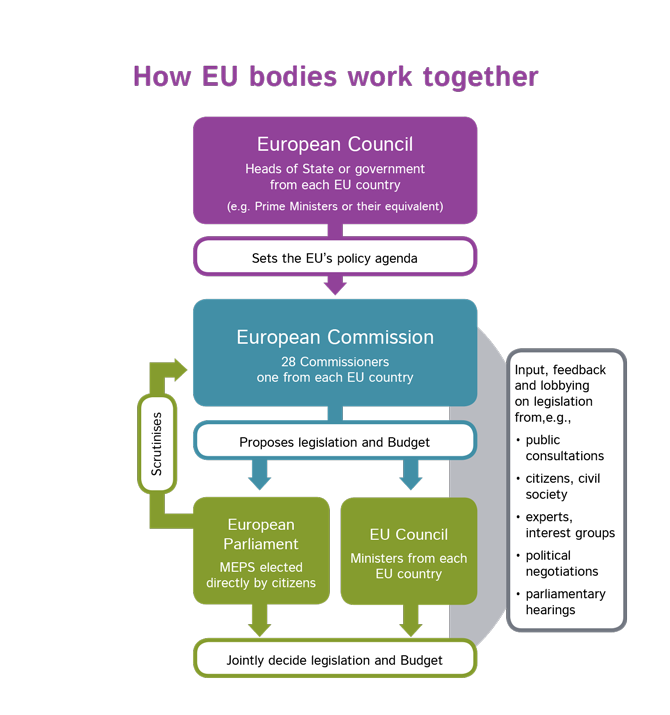 (The Annex to this blog post shows how the Commission is appointed in graphic form - compared to the UK). Moreover, starting from the current Commission (which took office in 2014) the candidates for Commission President had actually been nominated by European political parties in advance. So voters could make a judgment on which potential Commission President they preferred when they cast their vote in European Parliament elections – just as they can do the same for potential Prime Ministers when voting in a UK general election. This allows a connection between the voting choices made by citizens all across the EU in the European Parliament elections with the political colour of the selected candidate to the presidency of the Commission. The nomination of the President must be further approved by a majority of those elected Members of the European Parliament. For those who ask ‘how can I get rid of the Commission President?’, the answer is simple. He got that job in the first place because of the results of the European Parliament elections. If he runs again to be Commission President and you don’t want him to keep the job, don’t vote for his party (or for another party that would back him). Then the remaining members of the Commission are each proposed by Member States’ elected governments, and as a body, they must be subject to a vote of approval by the European Parliament. Prospective commissioners are also subject to individual questioning by the appropriate European Parliament committee prior to the European Parliament’s approval. How can voters vote out the European Commission as a whole? They don’t get to vote on the entire Commission – but that’s because the appointment process defers to Member States. People criticise the EU for not being a democracy, but in many ways it is an international organisation. We don’t usually expect international organisations to be democratic as such; rather their accountability comes from national governments’ participation in them. So we don’t get to ‘vote for NATO’ or ‘vote for the UN Security Council’; we vote for governments that represent us in those international institutions. Similarly, a vote in a British national election determines the political background of the British Commissioner: the current Commissioner is a Conservative, and the previous one was Labour. Some argue that Commissioners and/or its President must be directly elected. The idea of direct election for the president of the European Commission however reveals not only a misunderstanding of the Commission’s role (it is not supposed to act as the government of the EU) but also a lack of understanding of how national Heads of State or Government are appointed. For instance, there is no actual direct election for selecting the Prime Minister in parliamentary regimes like the UK. The Prime Minister would certainly be locally elected as an MP – like David Cameron is in Witney. Yet, he or she will become Prime Minister, strictly speaking, on the sole ground of being the victorious leader of a political party, which selected that leader beforehand, without asking citizens’ opinion. We also had examples in the UK of seeing an MP being coroneted PM without a general election being organised (Brown, Major and Callaghan, just in recent years). In other words, it is wrong to assume that electors directly decide on the identity of the Prime Minister; rather they select the leader of the country from a pool of names put forward by political parties. This is essentially equivalent to the appointment of the EU Commission. Similarly, it is also wrong to assume that national cabinet ministers (equivalent to the rest of the Commission) are always elected officials. This is for instance the situation in France where anyone can be appointed minister without having ever been elected to the national Parliament or to a local assembly. The UK cabinet has ministers from the unelected House of Lords. Even worse, in a multi-party system, as opposed to a two-party system, the citizens may find themselves with a government that does not represent the most popular political party, but which is the fruit of arrangements made between political parties after the elections are held – like the UK coalition government between 2010 and 2015. With these examples in mind, the selection and appointment of Commissioners by the European Council and the European Parliament cannot be said to be less ‘democratic’ nor less ‘transparent’ than the equivalents in the UK or other Member States. Furthermore, it’s possible for the Commission to be dismissed by the European Parliament – just like the UK’s House of Commons can pass a vote of non-confidence in a government. However, it’s true that this power has never successfully been used. Does the EU suffer from a comparison with the Member States in this respect? Not quite, as the power to dismiss the government has simply been lost at national level for a range of reasons: fixed election dates, the so-called rationalisation of parliamentary rules and a more disciplined partisan system. In the UK, for instance, we only have one example of a government brought down by a motion of no confidence since World War II. At the end of the day, the European Union’s institutional architecture and decision-making process merely reflect the twofold legitimacy of the EU as a union of States and of citizens on which competences have been conferred to meet common objectives. In other words, the legitimacy of the EU’s institutional architecture flows from two sources: the Member States, which are represented at the EU level in the European Council by their Heads of State or Government and in the Council by their governments which are democratically accountable to their national Parliaments, and the European Parliament, which is directly elected and represents European citizens. In this context, the highly consensual and arguably cumbersome process governing the selection and appointment of the Commission may be perhaps better understood and justified. If anything, one may even argue that it would be unwise, and one may even say undemocratic, to push for a complete ‘democratisation’ of the Union’s institutional architecture and organise the transformation of the Commission into something akin to a national government. Indeed, and contrary to popular wisdom, the strict implementation of a purely majoritarian system and the direct transplantation of the mechanisms associated with the national model of parliamentary democracy would, in all likelihood, undermine the EU’s legitimacy due to the ‘thin’ character of the European Union’s sense of collective identity. The resulting original system of government could be a hard sell to the man on the street, as it may differ from his instinctive (and, in most cases, idealised) understanding of what a democracy is or how one’s democratic system actually works. It may, nonetheless, be defended in the name of democracy, one where the value of consensus trumps the majoritarian features classically associated with the Westminster model of parliamentary or representative democracy. This is not to say of course that there is no room for improvement when it comes to the democratic life of the EU. It remains however ludicrous to describe the EU as an undemocratic ‘superstate’. For all its imperfections, the EU may actually offer the chance of political leadership at a level where the social impact of globalisation could be democratically and effectively managed. One may only that hope that people remember, to paraphrase Voltaire, that the best can quite often be the enemy of the good. Interesting read, I might want to add that while the Santander Commision wasn't brought down by a motion of no-confidence, if it hadn't stepped down it would have been removed.